Westerkwartier is a neighborhood in Delft, southwest of the Delft station, between the Coenderstraat, Westlandseweg, Krakeelpolderweg and Hugo Grotius Street. The district was formerly Wester Polder. The neighborhood is part of the district of Hof van Delft. Many small workers that are also frequently developed, the beautiful open water and ditch next to the town and the station, a lovely area to live. Along the Buitenwatersloot was from the late Middle Ages created the first building outside the city walls of Delft. There stood the mill Papegaeij which was demolished in 1936. The former Molenwerf is now a courtyard (Van Bakkeren grounds). Here too was the mill's Uyl. Later, there were companies established as two sawmills, a distillery and a yeast factory and later a factory belts. Between the present and the Van Bleiswyckstraat Saenredamstraat ever the castle farm of Bartholomeus van der Made, a cousin of Ada of Holland. The increasing industrial activity in Delft since 1847, when the railway line and station were built west of the defense canals, caused an influx of factory workers, which could be housed initially in the downtown area and along the Buitenwatersloot. Over time, however, there was no room and had to resort to one of the few areas outside the canals which belonged to the territory of the former Delft. 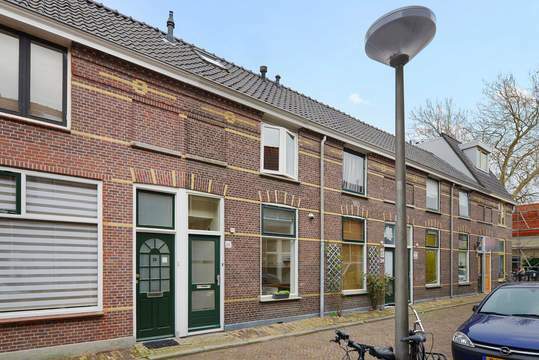 When in 1879 the street plan of municipal architect De Bruyn Kops had been established, low-cost housing for the workers could be built by two developers: contractors JP Henneveld and D. van den Bosch. 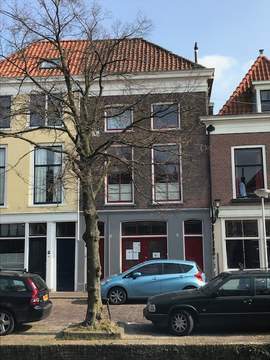 The first built especially the area around the Graswinckelstraat, the second round of the Van den Boschstraat (later Hovenierstraat). Along the eastern edge, the Coenderstraat were more expensive homes built for the middle class. Demands were by the Municipality of Delft not asked of the houses, there was as yet no 1901 Housing Act. Design for the Westerkwartier by C.J. de Bruyn Kops 1878. As one of the first streets was built Westerstraat in 1879 on the site of the Geldelozepad. On the Raamstraat Raamstraat Church was built. In the late 70th district was severely impoverished. In addition, the neighborhood was built very close to each other, there was hardly any open space and there were inadequate facilities for green areas, playing and parking. Initially, the municipality wanted to demolish the neighborhood because the quality of housing was too bad to fix. The resistance from the neighborhood, organized into a neighborhood committee and the drawing up of Labour Party alderman Reijnen been the defining factors. Ultimately, only 124 houses demolished. A courtyard was demolished at the Westerstraat and the ground pulled gardens Hovenierstraat. A block of houses has been replaced by the Carthuyzerstraat for a small square, a few houses on the corner of Garden Street and Westerstraat been replaced by a playground. There are 51 properties in town and owns approximately 60 privately owned properties improved. There is new construction come to the Carthuyzerstraat, Pottery Street, Pootstraat, Raamstraat, Ada Hollandstraat and Aurora Square. After this urban renewal project is in the early 80th lifted the neighborhood committee. In January 2001 Alderman Rik Grashoff announced parking permit to enter in the Westerkwartier and adjacent Olof Area. The neighborhood was furious and founded in response Belangenvereniging Olof Area-Westerkwartier on. New! € 1.250 per month ex.